Are you still worrying about the complicated ProRes video? Can’t play ProRes video in Quick Time smoothly ? Don’t know how to edit the ProRes video in Premiere Pro? It’s time for you to drop the ProRes and hug other main popular vidoe formats, like: H.264, MP4, MOV, AVI, MPG, etc. Even ProRes formats is soo cool which can support 8K, 5K, 4K, 2K, HD (up to 1920×1080) resolutions, but most media player, devices can’t support ProRes codec, comparing with some main popular video formats, this formats is out of style. *You can import any Apple ProRes codecs into this software, such as: ProRes 4444, ProRes 422 (HQ), ProRes 422, ProRes 422 (LT), and ProRes 422 (Proxy), etc. *Want to get 4K video, here, you can convert ProRes to H.265 MP4, H.265 MKV, H.264 4K MP4 with 4K video resolution. *HD video is supported too, you can choose MKV, AVI, WMV, MOV, MP4 video formats at 1080P resolution. *Amazing 3D videos are ready for you, you can select MP4, AVI, MOV, MKV, WMV video with 3D effects, then enjoy the video on VR headset. *Nice video editing and setting features, you can adjust the video and audio codec, video resolution, video frame rate, also you can change the video effects, add subtitles to video, replace music from video, etc. TIP: You can download the Trial version which is free, but there is watermark on video, you can also buy the official version for getting rid of watermark. 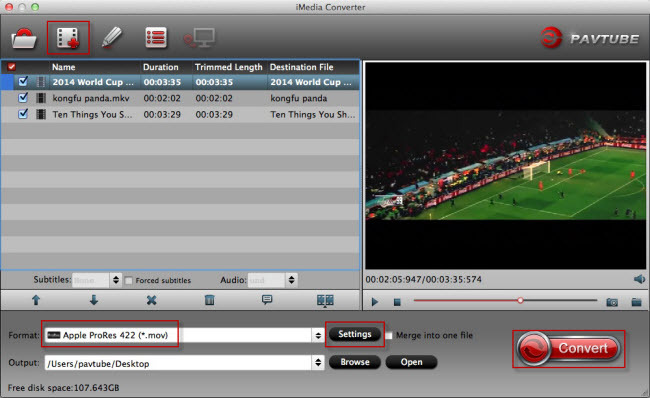 Download and install the video converter on your PC. Launch it and click “File” to import your videos and music. Good news, you can add a folder and put all the video into it, then choose "Load from folder", you can import multiple ProRes video files and do batch video conversion. Click “Format”, from its drop-down option, there are many category, you can choose one video formats from them, for example: You can choose “H.264 HD Video (*.mp4)” from “HD Video” main category. Best of all, user also can choose 3D MP4 from the “3D Video”. 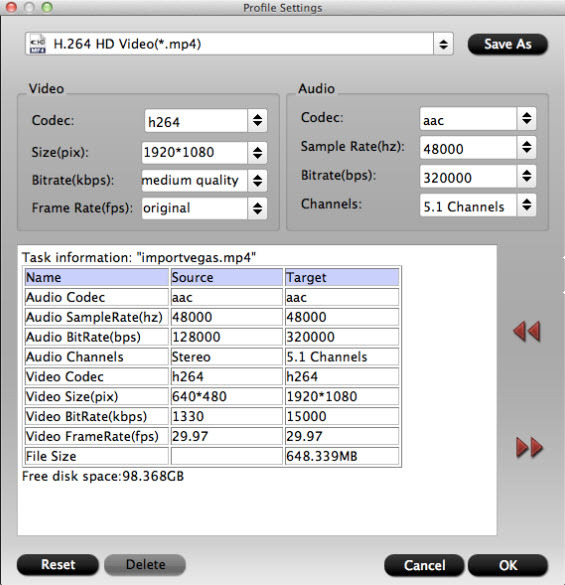 Of course, you can choose other video formats, such as: MOV, AVI , MKV from "HD Video", "Common Video", "3D Video". In addition, you want to play video on TV, you can choose the TV category as the output video formats. Tips: before the magic video conversion, you can click "Setting" button to adjust the video and audio parameters, details are as the following picture. Step 3. Begin ProRes Conversion. 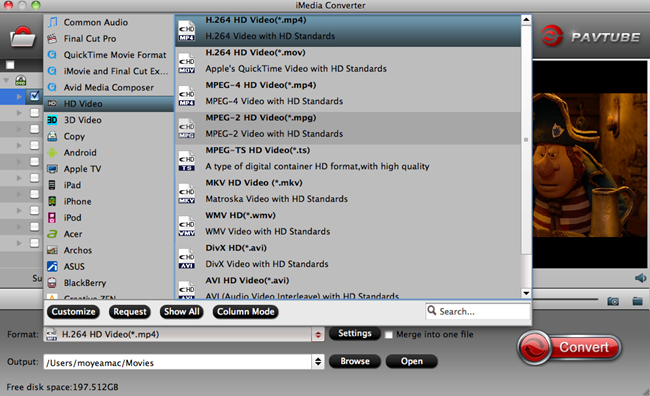 Go back to the main interface and hit right-bottom “Convert” button to convert ProRes MP4, MOV, AVI, MPG, etc video formats conversion. Just wait for a while, a new video will appear on your Mac. I have to say this tool is so easy and convenient, you can solve any issue about ProRes: ProRes playback issue, ProRes editing issue, ProRes backup issue, etc. Just enjoy the ProRes codec conversion.